Thailand has been inhabited since 9000 BC. and the oldest excavations dating from around 3600 BC. The primal people who lived then, gradually gave way to the Mon, Khmer and Malay peoples who inhabited the country until about the year 1000. In the first millennium the Siamese people came from Yunnan (southern China). The Khmer people were conquered in 1238 and the Buddhist state under King Ramkhamhaeng Sukothai was founded. This is seen as the first Thai state. Since then, Thailand has remained an independent country. Therefore Thailand means Land of the free . A century later, Sukothai had to give way against the powerful kingdom of Ayutthaya. 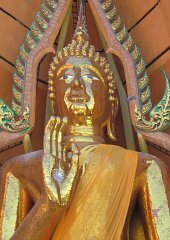 During the Ayutthaya era, Theravada Buddhism became state religion, integrated with Kmer, Thai and Hindu customs. After the fall of Ayutthaya in 1767, Thon Buri (the west bank of the mouth of the Chao Phraya River) became the capital. Several years later, after a coup by General Chakri in 1782 began the era of the Chakri dynasty, which still continues. The capital moved to the village, on the other side of the river, Bangkok. General Charki is proclaimed King Rama I. Wat Phra Keo, the largest temple in Thailand is built around the statue of the Emerald Buddha. Thailand has never been gecolonialiseerd country in its history. Over the years, the Chakri dynasty continued to maintain contacts with the western world. Especially King Chulalongkorn, Rama V (1868-1910) introduced many reforms, including the abolition of slavery. He is still extremely popular and 23 October is a national holiday in his honor. In 1932, after a non-violent revolution, the constitutional monarchy was introduced, which to this day still continues. In 1946 king Bhumipol Adulyadeh ascended the throne and is nowadays already more than 65 years the monarch of Thailand. Several coup attempts have occurred in the last century, of which some have succeeded. The last took place in 2006 to end the Taksin Shinawatra government, after months of protests. Although there is religious freedom, about 90% of the people adhere to Hinayana Buddhism and it is constitutionally established that the king is Buddhist. Yet one finds, in daily ritual, many influences of Hinduism and animism. Bangkok has grown into a metropolis with 7 million registered inhabitants (in reality this number is much higher). Actually the name of Bangkokis, Krungthep Mahanakhon Amonrattanakosin Mahintharayutthaya Mahadilokphop Noppharatratchathani Burirom-udomratchaniwet Mahasathan Amonphiman Awatansathit Sakkathattiya Witsanu Camp Rasit , but Thai people shorten this normally down to not more than Krungthep .